So, kind readers, I invite you to visit each of the five blogs I've listed below and – if inspired – leave them an inspired comment of your own! To be listed is considered a “special honor.” The Arte y Pico Award is meant to be paid forward to bloggers who are deserving of it. Nature Manipulated has presented me with the award and I would now like to present the award to the following five blogs. 2) Post the name of the author and a link to his or her blog so everyone can view it. 4) The award-winner and the presenter should post the link of the "Arte y pico" blog , so everyone will know the origin of this award. 5) Please post these rules! The Arte y Pico blog is in Spanish. To read it in English, click here. The translation is not perfect. And when we got home, together we made a growler empty too. May tomorrow be equally enjoyable yet a bit more productive. I made time for the garden today. I made rows (such as they are) and planted more seeds. Various lettuces, kale, winter cabbage, Chinese cabbage, dill, radish, calendula, and more. It felt good to work as the rain fell, drop by drop. I made time to enjoy Freya's day, a day of love with the boy and bottled love in the form of homebrew. I made a salsa with canned tomatoes and green love from the garden that we enjoyed with the home brew and some corn chips. I grilled veggies and made a dough with the leftover winter grains. These efforts became grilled pizza. Merry Friday one and all - a day of love - to go with a lifetime of the same. Enjoy! These past couple of days have been more about doing than making. You know? The doing is the physical part of magic that plays a key role in manifesting dreams. And it is worthy of attention. So ... I started a repeat batch of a crisp and bright Cardamom Ale. I started a trial batch of Rice Ale, which I've neither made not had before. And these two sit pretty with the Melissa Ale started the other day. Five gallons of an IPA was bottled yesterday and based on the pre-bottling taste-test, it's gonna be a good, good, good batch! I did make a few new Spirited Cord Chokers too. It's an act of relaxing meditation for me and I really enjoy making these little cords of intention. It's time to play the final June Win a Whimsy! It's extra easy this week. Just leave a comment to this post and let me know what YOU think I should make today! You'll be entered in a random drawing to win two of my Spirited Chokers! Whadda ya think? Come on - inspire me - to create or to laugh!! This week's whimsy winner is . . . Nici!!!! Thanks, everyone, for playing! What inspiration! Started a gallon batch of Melissa Ale, using fresh Lemon Balm. I adapted an 1827 recipe from Stephen Buhner's book, Sacred and Herbal Healing Brews. Tomorrow I'm starting another batch of Cardamom Ale because my second adaptation came out very nice and I'm ready to repeat. I love bubbling jugs! I made a garden salad of mixed cultivated and wild greens and lovely, colorful nasturtium flowers. Beautiful to look at and delicious to eat. That's what I made today. If you remember, I started an infused oil of Plantago on June 12, and it is ready today for straining and bottling. The color was rich and green with an earthy fragrance . . .
. . . so I strained it . . .
. . . without force . . .
. . . and put a small amount in a glass jar, heated it with some beeswax and a touch of lanolin and stirred it until the wax was fully melted and mixed . . . on a whim of inspiration I added three drops of essential oil of clary sage . . .
. . . and let it rest until it firmed up . . .
. . . labeled it and have it on hand for skin in want of soothing, cooling and healing. And when that was done I started a new batch of herbal ale. This time, Melissa ale. I know, I know! I still have this process to share here! All in good time . . . all in good time . . . It also seems that folks really like my spirit cord choker necklaces, so I made a new listing for them at my Etsy shop as well. I think I'll give two away for Win a Whimsy Wednesday this week! So, there it is: A bit of what I made today. I invested my morning in a drive to Coventry, CT where I participated in Coventry Farmers' Market's Summer Solstice Faire. There I found friends and cupcakes, egg sandwiches and fresh strawberries, cucumber plants and music . . .
. . . and more . . . much more . . . I met many folks, chatted a lot, and made new friends . . .
. . . and some sweet sales too . . .
About 10-minutes before my mini-lecture and demonstration on brining, a Kansas-variety sky made manifest above the treetops over the Faire. Winds whipped with enthusiasm, blowing vendor items here and there. I half expected to see Margaret Hamilton pedal by. Final purchases were hastily made as vendors packed up and the rains started falling. I didn't get to do my talk. But I do hope to return that I might! I made my way down and around . . .
. . . I made my way back up again . . .
. . . and as I wandered, I looked down . . .
. . . and I looked up . . .
. . . and I looked around . . .
. . . as I wandered from one paradise to another and made my way back home. Mid-summer arrives and I make a day to - mostly - revel outdoors in the realm of Nature, the sacred places of Green Divinity. I make a day to wander to the pond with the dogs . . . to wade into the intimate embrace of this fluid element surrounded my forget-me-nots, ferns, grasses and trees. I make a moment of pause to feel the silky clay ooze under my feet and between my toes. I make my way through pasture and woods, barefoot and barely clothed. I make my way down the long - very long - driveway to get the mail and up, up, up again . . . and I make a moment, a sacred moment to express gratitude for the simple capacity to do so. A year ago, I couldn't get out of bed without assistence. So as the sun takes its sweet time sinking into the arms of the loving horizon this evening, I too will take my sweet time to make a blessing to this life of mine. On this, the last full day of solar spring, I head a little north and a little west and make my way to a little patch of paradise I often call the 100-acre wood. I wander the meadows and forest edges. I pick wild things to simmer and sip. I soak a grateful body under an open sky as I admire the sun slip into the western treeline. I get to be the Gauguin girl that I am. I made my way to to a special place in my heart. I made a bit of progress today in the form of lists for these coming days when I will wander hither and yon and to and fro. I completed more "herby" and healing items for vending at this Sunday’s Summer Solstice Faire. I made preparations for the lecture I’m offering on Brining Vegetables. I made my way into the cold storage and pulled out the gallon of brined veggies made for demonstration in February’s fermentation class and they are delightfully delicious! I also grabbed the quart of kimchi that was made in that same class and oh, sweet Lady of all that is sacred, holy and divine in the universe, it is the best batch so far. I made a challenge to my CT Etsy Team that ended up in our Team Blog and in the Etsy Promo Forums that spurred some fun activity. I made a simple expression of gratitude to Nature for the sweet POEST Etsy Treasury in which one of my items was featured. I made some changes to this page. It's all part of a desire of mine to add more color and light to my life. That's something I've been working on this springtime season and the new banner here is what I made today. What did you make today ... or recently? Just leave a comment (any comment!) and you'll be entered in this week's drawing to win a whimsy! How 'bout a nice bookmark made of vintage fabric srcaps? I'll announce the winner sometime after midnight tonight! Thanks to each of our fifteen contestants! Thanks for visiting my blog and for making the time to leave a comment! So . . . drum roll please . . . this week's Win a Whimsy Winner is . . . Heather of That Little Boutique! Congratulations Heather!!!!! I made a few simple promo-packages and got those in the mail this morning. I also made a gratitude package that will be mailed on Thursday. I made some phone calls and when these and other matters of utility were managed, I started to prepare for Sunday's Summer Solstice Faire in Coventry, CT. The Faire is part of the Coventry Regional Farmers' Market'. I happily agreed - a while back - to offer a brief lecture on brining as a method to preserve our harvests throughout the growing season. I was offered a vendor's space and hemmed-n-hawed ... and learned yesterday that a space had been confirmed for me. Thus the preparations yesterday! Something inspired me to blend together a bit of organic & fair-trade Ceylon and organic pink rose petals, for a really nice and simple blend called "A Little Love Tea." And I made only one mis-harvest in the effort. And how lovely is she, this maiden berry? So much love ... and the day's not over yet! Enjoy!! Today was a day of planning and organizing for tomorrow. Tuesday should be filled with creations! Wait! Today is tomorrow already! The garlic scapes were well curled and ripe for "harvest" today. I lovingly tossed them into my food-processor, added a bit of salt and some olive oil and chopped them well. I prepped them for the freezer where they will rest a bit before being solid enough make their way into a freezer bag for the deep freeze. Oh, and I got to lick my fingers! I also put a first coat of gesso on this ... though you might not be able to imagine what it is, or rather--what it will be, but I got that started and in the making! More on this at some point in the future. Right now ... I'm gonna go doodle. Enjoy your Sunday evening! Got your attention did it? Now, let's see how long I can hold it . . . 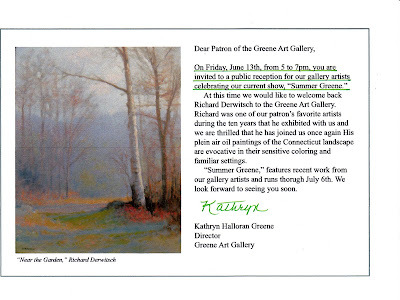 The artists' reception at The Greene Gallery last night was quite nice. Good music, nice wine, tasty food, lovely art to gaze upon, some very charming artists too, and some red stickers as well. Among my garden adventures today day I stalked the wild strawberry . . . I enjoyed the sunshine blossoms . . . I kept a promise to myself to make at least one doodle-a-day . . .
And enjoyed the most recent "ready" homebrew we call Bitter Malt. "BM" for short. And I gotta say, there's little in life more enjoyable than a good BM. Hey - I can be crude. It's MY blog. I picked a lovely bunch of clean, dry Plantago leaves (better known 'round these parts as plantain). Stupid people poison them. I packed them loosely in a glass jar. I covered them with olive oil. I placed them in my dehydrator, set at about 100 degrees F and set the timer for 3-4 hours. I'll continue this process every day for the next several - until it FEELS ready to strain. But more on that when the time is ripe. Listen to the seed of wisdom within. Now - go make some oil! It's time again to play Win a Whimsy Wednesday! All you need to do to play is post a comment - any comment - here today to be entered in a drawing to win something free - made by 'lil ol' me. This week's winner will be announced late tonight and they will win one of those sweet mini-journals I've made this past week! Today you will work for your comment (or not), for my question requires you to visit another blog: When Weeds Whisper. There, in the sidebar to the right are seven springtime herbs that grow right here on my little acre. Can you name them? Remember, it doesn't matter if your comment is correct or not to be entered in this give-away, and fanciful responses are ever so much fun. So . . . get to it! Leave a comment! Win a whimsy! And our winner is Tammie's Mom!!! ... one more thing ... 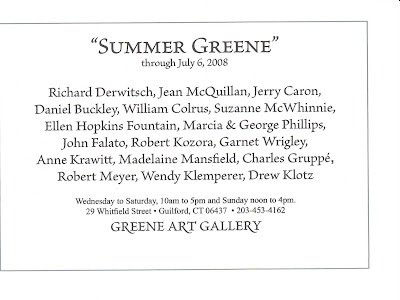 I made these scanned images of a postcard invitation that was received today ... in case you're looking for something to do Friday evening in Guilford, CT - you're invited too!